I went back to my home country, Taiwan, last month and had the chance to devour my all-time favorite, great Taiwanese “small eats” (xiaochi, i.e. “snacks”). Here I’m going to share with you some popular ones that you can find at hawker stalls on the street or in the night markets. Pork intestines thin noodles (“da chang mian sian”) is a very popular snack in Taiwan. Main ingredients include pork intestines, thin noodles, cilantro and cornstarch (to thicken the soup). 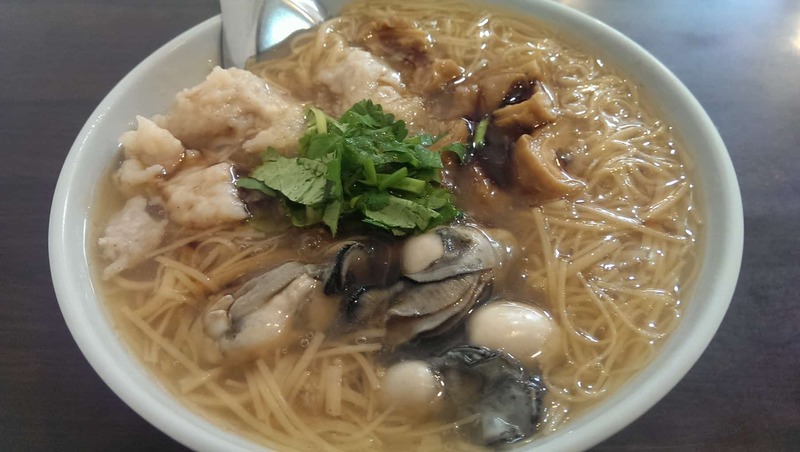 You might find some places that add other ingredients to the noodles, such as oysters and meat dumplings. When it is served, we tend to add seasonings like black vinegar, mashed garlic and chili sauce to make it more flavorful. Stinky tofu (“chou dou fu”) is my most favorite snack and I will definitely recommend it to adventurous travellers. It is deep fried fermented tofu. Very crispy on the outside but soft and juicy on the inside. Although it has a strong odour, you don’t actually taste it when you give it a bite. (Kev is Canadian and he can tolerate the smell) Usually, it is served with Taiwanese style pickled cabbage. If you like it spicy, you can ask the vendor for some chili sauce. Now there are many versions of stinky tofu. Deep fried tofu is the most common, most traditional kind (and has the strongest odour). If you are not daring enough to try the deep fried version, you can try the BBQ stinky tofu (“tan kao chou dou fu”) or steamed stinky tofu (“qing zheng chou dou fu”). BBQ stinky tofu is Kev’s favorite. Pig’s blood has abundant nutritional values- it is rich in protein, iron, vitamin C, calcium and other minerals. 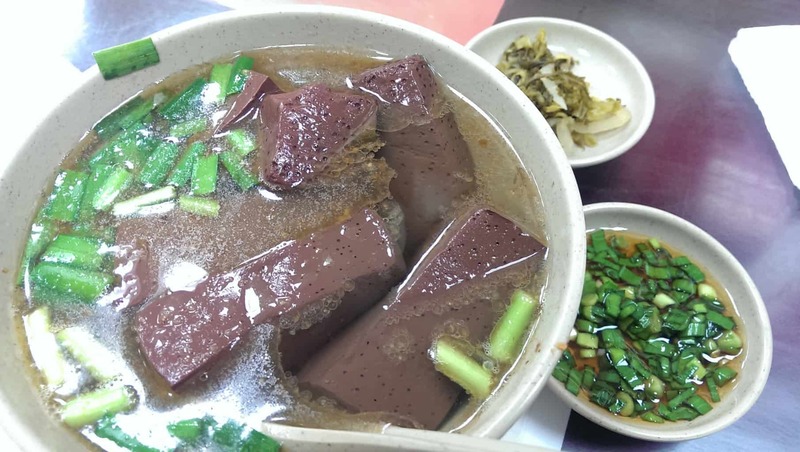 I love pig’s blood soup (“zhu xie tang”) for its light flavor and fresh chewy blood cubes. The soup base is stewed for a long time with pork bone. The satay sauce and fresh chinese chives add some flavor to it. 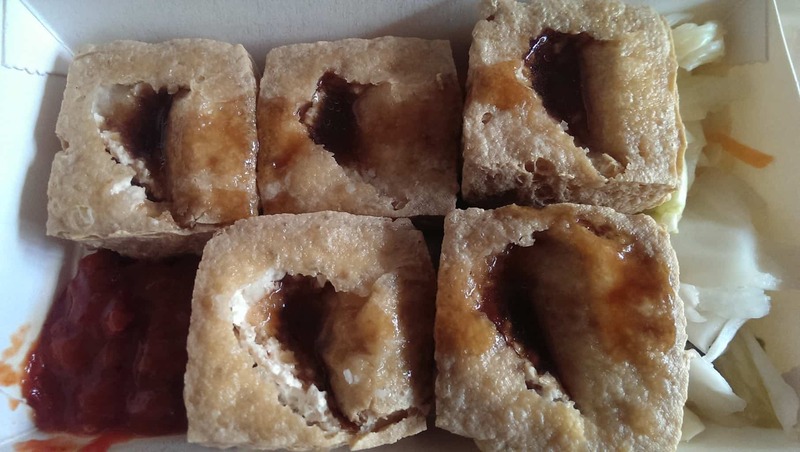 The rectangular blood cubes are soft and chewy. The texture is similar to soft tofu. The blood cubes absorb the soup and taste slightly sweet. If you want a stronger flavor, you can make your own sauce to eat with. Some people like to dip them with light soy sauce and minced chinese chives. Some like mashed garlic and chili sauce. Steamed shrimp meatball dumplings (“qing zheng xia ren rou yuan”) is a traditional snack from a city in southern Taiwan, called Tainan. 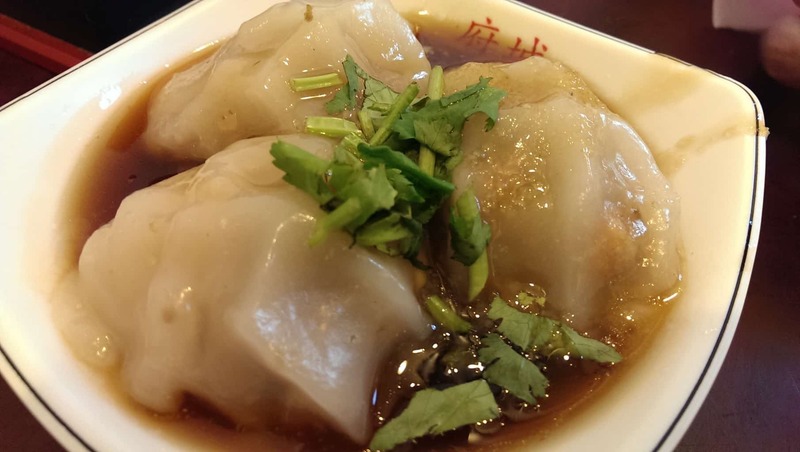 The dumpling skin is handmade out of rice milk, giving it a soft and chewy texture. The stuffing contains stir-fried pork and shrimps. It is served with seafood sauce, sprinkled with cilantro. Some of you might find some local street food horrifying (“What? You eat animal organs?!”). I admit that to truly enjoy the food in Taiwan, you must have an open mind and an adventurous spirit. At the end, you might find yourself blown away by the flavors and addicted to the deliciousness! do Taiwan still sell pig’s blood soup? And which night market can I find it in Taipei? I am looking forward to it on my trip next month to Taiwan. It was my childhood favourite.